16 November 1977 - England 2 Italy 0 - World Cup qualifier at Wembley - Cherry and Brooking starting with Trevor Francis substituting (but not for one of the other Trevors). 13 May 1978 - Wales 1 England 3 at Ninian Park - British Championship - Cherry, Brooking and Francis starting. 10 June 1979 - Sweden 0 England 0 in Stockholm - friendly - Cherry and Francis starting with Brooking substituting (but not for one of the other Trevors). We went over the match summaries fairly carefully, and we're pretty sure there are no matches with four Trevors. Q. from David Long, location not given, 21 March 2002: I am researching an article for a local newspaper. Could you help with information on those players who were born in the West Country [Wiltshire, Gloucestershire, Somerset, Devon, Dorset and Cornwall as well as Bristol] and have represented England at senior level since 1948. I can name nine: Nigel Martyn, Gary Mabbutt, Mick Channon, Trevor Francis, Keith Curle, Larry Lloyd, John Atyeo, Mike Summerbee and Geoff Bradford. I would welcome additions from compilers or readers. A. from PY. The best source of information for biographical facts on all England players prior to 1990 is Douglas Lamming's An English Football Internationalists' Who's Who (Hutton Press 1990), which should be available at your local library. It is also available through various booksellers. On page 286, Lamming has a list of the traditional counties along with the number of England players born there. But one has to go through his book player by player to get their birthplaces. Perhaps our readers can help on this? Q. from Owen Jones, Search Data Editor, Getty Images (UK) Ltd, London, U.K., 20 March 2002: I've searched all over the place trying to find this basic nugget of information, but how many players are countries allowed in their squads at World Cup 2002? A. from PY. For World Cup 2002, FIFA has increased the squad size by one, to 23 players. When the limit was 22, most teams took three goalkeepers, which meant they only took 19 outfield players, one player shy of two full sides. The new limit of 23 allows teams to take two full sides plus a third goalkeeper. Q. from Alexander, St. Petersburg, Russia, 20 March 2002: When and where England international football team played world cup qualify match on the neutral venue and what the score was? A. from PY. On 17 November 1993, England beat San Marino 7-1 in a World Cup qualifying match in Bologna, Italy. We would question whether Bologna was truly a neutral venue. San Marino chose to play some of their home matches there. Q. from Keith Farrell, Dublin, Ireland, 11 March 2002: The Euro 1980 squad listed on the site includes a Steve McMahon. Surely not? I didn't think he made his debut until 1988? P.S. Very interesting site even to an Irishman. A. from PY. You're right, of course. We're grateful for your correction--and for any others readers send in. To spare ourselves some work, we simply saved the European Championship 1988 squad page as the European Championship 1980 page and changed the player names where appropriate--or thought we had done until we received your message. The correction has now been made. Q. from Peter, Derby, England, 6 March 2002: Could you please tell me who were England's first opponents at Wembley after it became an all-seater stadium? A. from PY: The first match staged at Wembley after it went all-seater was the friendly against Uruguay on 22 May 1990. Only 38,751 spectators turned up as England lost at home for the first time in six years, 2-1. I would be grateful for confirmation of the team, the date of the match, and the fact that Billy Steel (then of Greenock Morton, later of Derby County) scored a goal, perhaps the winner, with a tremendous shot from outside the penalty box. A. from PY. We have a section devoted to England players who have appeared for international representative selections, and it has the summaries for this match and many others. The match was played on 10 May 1947 before 130,000 at Hampden Park in Glasgow, Scotland to celebrate the readmission of England, Scotland and Wales to FIFA. Great Britain won, 6-1. Your lineup is off by only three players, pretty good considering it's 55 years since the game. Hardwick, England, and Hughes, Wales, were the fullbacks, not Young and Scott, and Macaulay, Scotland, was the right half, not Wright. Steel scored Britain's third goal; Mannion scored the first two and thus got the winner. Steel was indeed still with Greenock Morton, but was playing for Derby County the following season, 1947-48. We don't know how Steel scored; perhaps our readers can help. Q. from Paul Robinson, Kenata, Ontario, Canada, 20 February 2002: I believe that Kevin Phillips has yet to make a competitive appearance for England. Therefore, couldn't he play for any of the other three home nations? I would think that Scotland could fit him in somewhere as a definite starting striker. A. from PY. I don't think he could even assuming that he has made no competitive appearance for England and that he has a parent or grandparent born in one of the other home countries. FIFA's regulations provide that a player "will be deemed to have committed himself to one association only when he plays his first international match in an official competition (at any level) for that association." So far, so good because the custom has been to regard "official competition" as excluding friendly matches even though all games between the senior teams of two countries are regarded as official matches and certainly constitute competition. But the home countries entered an agreement regarding international eligibility in 1993 which provides that a player holding a British passport is eligible to play for the country of his birth, the country of the birth of either of his natural parents or the country of birth of any of his natural grandparents. My understanding is that once a player has chosen to play for one of the home countries, this agreement would preclude him playing for another. So even if Phillips has not appeared in competitive play for England and even if he has a parent or grandparent born in one of the other home countries, his first appearance for England in a friendly constituted an irrevocable commitment to England as far as the home countries are concerned. Strangely enough, again assuming he has made no competitive appearance for England, he might still be eligible under FIFA's regulations to play for a country outside the U.K. if he gained naturalisation there. If I'm wrong on any of this, I hope readers will correct me. Q. from Nick Culshaw, Blackburn, England, 20 February 2002: What date was the last England international match (competitive or friendly) played in the Admiral sponsored kit? "England last wore an Admiral sponsored kit in one of these two games, both European Championship qualifiers: England vs. Denmark, 21 September 1983 or Hungary vs. England, 12 October 1983. I am sure England were wearing their Admiral kit in the game against Denmark. I am also sure they were wearing their new Umbro strip against Luxembourg on 16 November 1983. As I have no picture of the intervening Hungary game - in which they could have worn either an Umbro or Admiral kit - we'll have to content ourselves with nearly getting it right!" Postscript from CG. As with everything in the website, progress is the aim, and we were able to answer this question with accuracy. The umbro strip did not come into existence until February 1984. Therefore, England last wore Admiral in November 1983 against Luxembourg. Q. from Seamus Mc Cann, County Fermanagh, Northern Ireland, 13 February 2002: I know the great Alfredo Di Stefano played against England for the Rest of the World in 1963 but did he ever play for Argentina, Colombia or Spain against England? A. from PY. You're right that Di Stefano--my choice for one of the top two spots on a list of the greatest players ever, and I'm not sure which one--played for the national sides of these three countries. Di Stefano played for Argentina only in 1947 (8 caps, 6 goals), before they first met England in 1951. England never would have played Colombia while Di Stefano was playing for them because Colombia were in hot water with FIFA over their renegade league; none of Colombia's matches in that period have been accorded official status. In any event, Colombia and England did not first meet until 1970. Di Stefano played for Spain from 1957 to 1962 (31 caps, 23 goals) and faced England in a pair of dazzling matches in 1960. In the first, played on 15 May before 87,250 at Estadio Bernabeu in Madrid, Spain won 3-0. In the second, played on 26 October 1960 before 80,000 at Wembley Stadium, England won, 4-2. Di Stefano did not score in either match, although he figured in some of the goals. Spain were loaded with stars, including many from the majestic Real Madrid side that won their fifth straight European Cup that year in a still-celebrated 7-3 victory over Eintracht Frankfurt at Hampden Park in Glasgow. They had perhaps the world's strongest side that year and probably would have won the first European Championship (then known as the European Nations Cup), but on General Francisco Franco's orders, they forfeited their quarterfinal match against the U.S.S.R., the eventual winners. In the last few minutes of the Madrid match, Spain sought to humiliate England the way Real Madrid did Eintracht Frankfurt, passing the ball around with great style and precision but for no other purpose than to show their total command of the game (although eventually they said enough of this and scored a late third goal). On the Wembley return, England gave Spain the same treatment. Q. from Justin Hillier, London, England, 10 February 2002: Can you please clear up a dispute? Has Alan Shearer ever missed a penalty for England? "Actually Shearer did miss one penalty. I remembered this was away in the World Cup Qualifier in Poland on 31 May 1997. Shearer hit the post. The penalty was given for holding Shearer down in the area. I have reviewed the video and it certainly was a miss! I don't recall any other penalty misses during his international career." We aren't absolutely sure this was his only miss, but presumably confirmation of one miss is enough to settle your dispute. Do any readers know whether there was another Shearer penalty miss? Some day we hope to have a list of England's penalty misses as well as penalty successes. Q. from Jason Ives, Slough, Berkshire, England, 10 February 2002: Could anyone tell me which members of the World Cup winning team never played in an F.A. Cup final. One was George Cohen but there were two others. Can you name them? "I'm fairly sure that the two other '66 World Cup Winners who never played in an F.A. Cup final were Nobby Stiles - (left out of the 1963 Manchester United winning side) and Martin Peters - (left out of the 1964 West Ham United winning side)"
Q. from Niels Wichmann, Denmark, 10 February 2002: A friend of mine told me, that a football nation from Europe, at the World Cup Championship in Brazil in 1950, travelled there by ship and not by airplane. I think it was England, but I'm not sure. Was it England ? - and if - why did they travel with a ship??? A. from PY. It was Italy. The reason was that on May 4, 1949, just the year before Brazil's World Cup, an airplane carrying the Turin football team home from a friendly match in Lisbon crashed at the Superga Basilica just outside Turin, killing all aboard. Turin then dominated Italian football, and among the 28 fatalities were eight Italian internationals, including Valentino Mazzola, who captained the Italy team that England beat, 4-0, in Turin in May, 1948, and who fathered Sandro Mazzola, Italy's great forward at the 1966, 1970 and 1974 World Cups. England flew to and from the World Cup in Brazil. There are photos showing the players disembarking from planes on their arrival in Brazil and on their return to England. Q. Back in December, 1999 one of our readers wrote that he was sure Terry Cooper had broken his leg and been unable to join England for World Cup 1970 in Mexico while his friend claimed Jairzhino took the ball around Cooper before crossing the ball for the Pele header that forced Gordon Banks to make the historic save many reckon is the finest ever. We told him he was wrong and his friend correct, and that we had been unable to determine if or when Cooper broke his leg. Now comes the answer from a helpful reader. Thanks, Seamus. A. from Seamus McCann, Enniskillen, Northern Ireland, 8 February 2002: The following is from Andrew Mourant's 1992 book Leeds United - Player by Player: "Once it had developed full momentum, Cooper's career became full of extravagant peaks - his beautifully volleyed goal which won Leeds their first major trophy, the League Cup in 1968 - and troughs, worst the broken leg sustained in an away match against Stoke in April 1972 that robbed him not only of an F.A. Cup winners medal, but of games in which to enthrall crowds when at the height of his powers. Cooper's emergence, as much as anything, helped Leeds shuffle off their image as a dour side." So it was the 1972 F.A. Cup Final that Coooper missed through a broken leg. Keep up the good work...the site is brilliant even though I'm not an England fan!! Q. from Andrew Edwards, Grimsby, England, 8 February 2002: Which four captains from England, Scotland, Wales and Ireland played in the same Merseyside derby in the 70's? Could this be in the 1977 season? This is just a guess but the four captains could be: Emlyn Hughes (Liverpool - England captain), Bruce Rioch (Everton - Scotland captain), Bryan Hamilton (Everton - Northern Ireland captain) and Joey Jones (Liverpool - Wales captain)." Q. from Paul Bryan, Doncaster, England, 1 February 2002: Who was Johnny Hancock? I believe he was a former England player. I have searched the web but found nothing. A. from PY. I'll bet your search turned up John Hancock, one of the signers of the American Declaration of Independence in 1776. His signature on that historic document was so prominent that his name became a synonym in the U.S.A. for signature, as in "Put your John Hancock here." The player you want is Johnny Hancocks, with an "s" on the end. Hancocks was a talented goalscoring winger for Wolverhampton Wanderers in the late 1940's and 1950's. He could play either wing, although he was better on the right and usually played there for the Wolves. He was fast, clever with the ball and had a powerful right foot shot that belied his small physical stature, 5'4". He scored 168 goals in 378 appearances for Wolves from 1946 to 1956. It was Hancocks' misfortune to reach his peak when England were blessed with marvellous wingers--Stanley Matthews, Tom Finney, Bobby Langton and Jimmy Mullen. He earned only three caps, each about a year apart, and was put at outside left in his first two England matches. He scored twice on his debut, the 6-0 thrashing of Switzerland at Arsenal Stadium on 2 December 1948. His next appearance came in the 4-1 victory over Wales at Ninian Park in Caerdydd on 15 October 1949. He played at his usual outside right in his last England appearance, the 2-2 draw with Yugoslavia at Arsenal Stadium on 22 November 1950. You can read more about his exploits on the Wolverhampton Wanderers official website. Q. from Gary Maxwell, Belfast, Northern Ireland, 27 January 2002: My Grandfather, David Maxwell, refereed the match between England and Scotland at Hampden Park on 10th April 1948, and in my far, distant childhood I can recall a photograph of the match featuring a large bank of the 100,000-plus crowd with my Grandfather resplendent (as they wore back then) in his referee's blazer. Would anyone know where this or other mementoes of the match can be obtained ? Yours (in anticipation), [signature]. A. from PY. We don't have any photos of this match. We suggest you try the Mirrorpix, Empics and Allsport photograph archives. You may also want to write or e-mail the librarians at the FA and the Scottish FA. Perhaps our readers may be able to help. By the way, the first place I looked was Mike Payne's England: The Complete Post-War Record, and he has the referee listed as one L. J. Dates. I thought, uh-oh, another case of a grandfather spinning tall stories. But then I went to the Scottish F.A. 's website and their match summary lists the referee as "David Maxwell (N Ireland)." So I'm relieved I don't have to burst a family legend. Q. from Andrew Bentham, Dhahran, Saudi Arabia (BAe Systems), 14 January 2002: Did Bob Wilson (ex Arsenal goalkeeper) ever play for England? A. from PY: Bob Wilson played for England Schoolboys, but never for the England senior side. He did, however, play for Scotland twice. In fact, he was the first English-born player capped by Scotland, eligible because of parental birthplace. Q. from Bill MacLagen, location not given, 10 January 2002: For which World Cup (i.e., year) was the emblem used to promote the England football team a bulldog. At least I think it's a bulldog! He is standing with his right foot on a ball and appears to be wearing the England kit of the day ... three lions on badge on left of shirt, v-neck shirt, stripes horizontal on shirt, vertical on shorts. Bulldog's mouth is closed ... two teeth protrude. 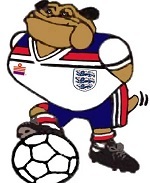 A. from PY: A live bulldog, Winston, was England's mascot at the 1970 World Cup in Mexico, but we think the bulldog you have in mind is Bulldog Bobby, England's mascot at the 1982 World Cup in Spain. Here's a photo we retrieved from the web, thanks to a pointer from Colin Purdew, who has an excellent football badge website (now defunct), and to an image cleanup job by our own Josh Benn. Bulldog Bobby is wearing the Admiral home kit of the time. Q. from Danny Casson, London, England, 8 January 2002: Can you tell me the team and scorers from the 7 December 1932, England v Austria friendly at Stamford Bridge? It finished 4-3 to England. I believe the Austrian team had not been beaten for the 40 straight matches leading up to this game. Can you guide me as to where I can get any footage or films of the match? A. from PY. The Austria side of the early 1930's were feted as the Wunderteam and regarded as Continental Europe's strongest side. They brought to football the intricate Danubian short-passing game known as the Vienna School, and they had gone 14 matches unbeaten when they met England near the end of 1932. While England managed to win, the match reports generally agreed Austria had played the better football, particularly in the second half, and the game was one of the first indications that England's football supremacy was doubtful. The two opposing centre-forwards, both scorers that long ago day, suffered tragically early deaths. Jimmy Hampson scored five goals in his three matches for England�one against Northern Ireland and two against Wales in 1930 as well as his two against Austria in 1932--and 289 goals in 423 Football League matches, nearly all as Blackpool�s centre-forward. On 10 January 1938, in his 11th season with Blackpool, he joined a fishing party in Morecambe Bay. His boat collided with a trawler, and his body was never found. He was 31. Matthias Sindelar, the brilliant centre-forward who also scored for Austria in their 2-1 win against England in Vienna in 1936, was known as Der Papierene (Man of Paper) because of his slender build and his ability to slip through defences. He scored 27 goals for Austria in 44 internationals. But the Anschluss of 1938 brought the end of the Austrian national side and the removal of Jews from his beloved club side, FK Austria Wien, including teammates, club officials and fans. A staunch opponent of the Nazis, Sindelar refused invitations to play for the German national side and infuriated Nazi officials when he led �old Austria� to a 2-0 victory over the new Austro-German side in what was supposed to be a �reunification� match. On 29 January 1939, he and his new girlfriend were found dead in his apartment. He was 35. The official verdict was accidental death by carbon monoxide poisoning, but questions remain. More than 60 years after his death, all the Players of the Century lists featured his name, and he was honoured as Austria�s Sportsman of the Century. England: Harry Hibbs, Birmingham, goalkeeper, Roy Goodall, Huddersfield Town, right-back, Ernie Blenkinsop, Sheffield Wednesday, left back, Alfred Strange, Sheffield Wednesday, right-halfback, Ernie Hart, Leeds United, centre-halfback, Eric Keen, Derby County, left-halfback, Sammy Crooks, Derby County, outside-right, David Jack, Arsenal, inside-right, Jimmy Hampson, Blackpool, centre-forward, Billy Walker, Aston Villa, inside-left, and Eric Houghton, Aston Villa, outside-left. Austria: Rudolf Hiden, Karl Rainer, Karl Sesta, Karl Gall, Josef Smistik, Walter Nausch, Karl Zischek, Fritz Gschweidl, Matthias Sindelar, Anton Schall and Adolf Vogel. Coach: Hugo Meisl. Goals: England - Jimmy Hampson, 5 mins. ; England - Hampson, 27 mins. ; Austria - Karl Zischek, 58 mins. ; England - Eric Houghton, 77 mins. ; Austria - Matthias Sindelar, 80 mins. ; England - Sammy Crooks, 82 mins. ; Austria - Zischek, 87 mins. Ambrosius points out, correctly, that Houghton's goal came on a free kick that took a lucky deflection off the Austrian wall. And that was the difference on the day. As for film footage, perhaps the British Movietone News website will be helpful. Ambrosius suggests you also inquire at two websites--Film Archiv Austria, a private Austrian film archive, and ORF.at, the official Austrian television company--although he does not know whether footage of the match is available. Q. from Marco, Dulwich, London, England, 7 January 2002: A friend alleges that Southampton once fielded 11 England captains. Can this be true? A. from PY. We've never heard this, and if you look at the lists of captains on our site, it's plainly impossible. We don't know that Southampton have ever fielded 11 England players, active or former, at the same time, let alone 11 England captains. Q. from Owen Philipson, Stirling, Scotland, 3 January 2002: Have you any idea which player scored four goals for England in their 6-0 win over Wales on 18 March 1901? I am trying to complete a Christmas quiz, and my Internet searches have so far proved fruitless. Any help is much appreciated. A. from PY. There's a chronological list of multiple goal scoring feats on the website. Click the link and look for your match.